The deluxe version for use in your home. It combines temperature, humidity and air pressure. The cheap version for use in large networks of temperature sensors. No frills, it just measures temperature. For a large network your best bet is the standard Dallas DS18B20. It's accurate, inexpensive and you can connect many of them in parallel without using more than one digital input on the Arduino board. One Arduino pin can support 16 sensors! They come in several variants: probe, individual, brick and a waterproof version. 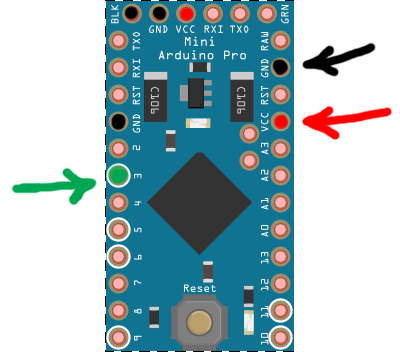 Per Arduino you will also need a small pull-up resistor to make the circuit work. It is usually around 4,7kOhm. Start by connecting the radio module. 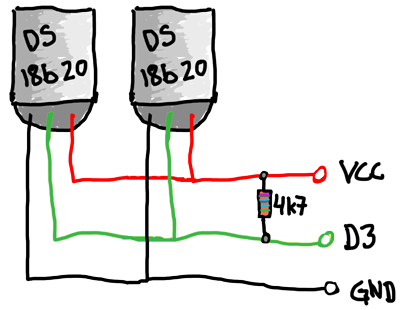 This is the same proces for every MySensors node.